Treating yourself is a great way to stay motivated on the way to bigger goals. A piece of candy or bite of chocolate seems a small reward for a job well done, but calories and sugar sure can add up. November 14th of each year is World Diabetes Day, set aside to raise awareness and highlight steps towards the prevention of this condition. One of the best ways to celebrate is to pick up a new good habit to replace a bad one. Buying flowers for yourself is a great way to add a bit of beauty and nature into your life. Rather than treating yourself to favorite foods when you feel like you deserve a little something special, consider a lush bouquet of one of the sweet blossoms below. Not only are they sugar-free, they will last much longer than a moment on the lips without going straight to your hips. Said to represent gallantry and finesse in the Victorian language of flowers, Sweet William (Dianthus barbatus) is a close relative to the carnation. Soft-petaled clusters of flowers top a sturdy, bluish-grey stem and come in variegated colors of pinks, reds and whites. Legend has it that this European wildflower was named for the bard, William Shakespeare, though evidence of its cultivation in English and Scottish gardens can be found long before he penned a word. Contrary to the name, the scent of the Sweet William is more spicy than sweet, compared frequently to cloves, and has a rich, mouth-watering allure. Long stems add lasting power to this flower in a vase, where they can be mixed with lilies or hypericum berries for a fabulous fall floral arrangement. Frequently grown to accent a garden, this perennial flower cascades over rock walls and along meandering borders in the landscape. In a vase or flower arrangement, candytuft (Iberis sempervirens), is prized both for its dainty blooms as well as for its glossy foliage. Short stems hold up delicate clusters of white, pink or lavender flowers, which look great made into a small tussie-mussie or tucked into a short vase. The scent is subtle, but the frilly effect of this flower looks amazing next to small spray roses or carnations. So delicious looking, it’s a wonder they aren’t edible. The sweet pea (Lathyrus odoratus) is best enjoyed with the eyes and nose. 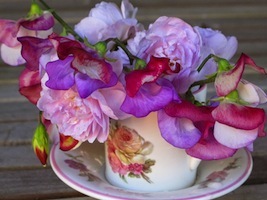 A gorgeous, vining plant, the flowers of the sweet pea come in a rainbow of colors that fade and blend into each other. Dainty and lyrical in appearance, the best feature of this floral eye candy is the scent, which is sweet and zero calories.